Two of the first commissioned artworks in the Capitol were installed in the lunettes, at the ends of the atrium vaults. They were painted by Girard Hale, of Utah, and Gilbert White, of New York. 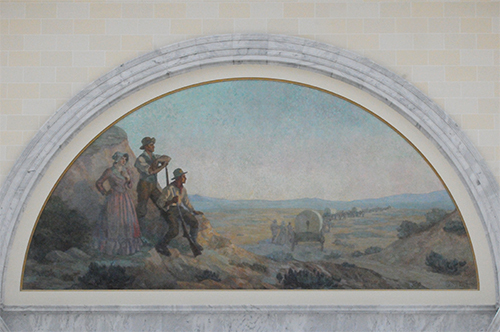 The west mural, The Passing of the Wagons, depicts the arrival of the pioneers in the Great Salt Lake Valley. It depicts the valley as first seen by pioneers in July 1847. 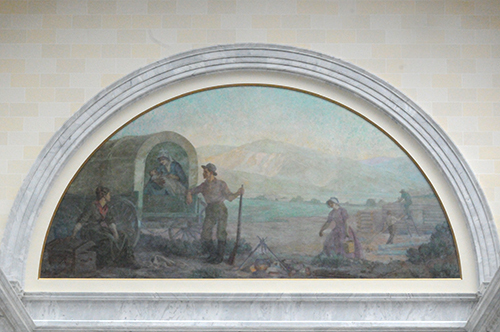 The east mural, Madonna of the Covered Wagon, depicts a desert turned lush by irrigation and families establishing their new homes.